Join the Elmbrook Shooting Sports Rotarians for a shotgun outing to break some clay targets at the Waukesha Gun Club, N22W23170 Watertown Rd, Waukesha, WI. We’ll meet at 6:15 p.m. for some shooting fun. 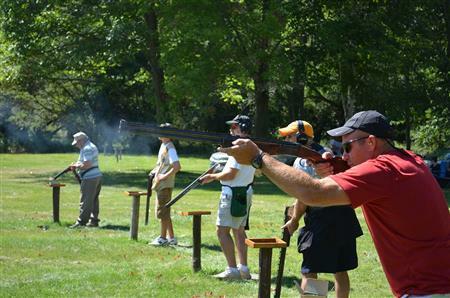 We’ll shoot sporting clays, which is much like golf with a shotgun. We will walk a course that has shooting stands set up with different clay target presentations. Anyone new to shooting is welcome. We’ll have seasoned shooters to coach and help you out. If you don’t have a shotgun, contact Harry Farchmin, and we’ll arrange for one of our members to bring one for you to use. The club also has shotguns for rent. After shooting, we’ll gather for some refreshments and socialize in the clubhouse.